Streatham Common is the venue for a free Olympic-themed fun day on 14 July to be staged by local churches with support from Fusion to build community atmosphere. Organisers expect more than 1,000 people to enjoy free refreshments and activities at the Love Streatham event. Love Streatham is a group of local churches working together to show God’s love in the community. 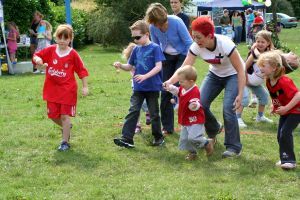 It will be aimed at families with free refreshments, bouncy castle, face painting and lots of sporty/Olympic style activities. The aim is for everything to be free. We are also thrilled to have Fusion involved who are helping us to create central activities throughout the afternoon that draw in people and give people a sense of belonging and community. Nikki Kuhrt, an organiser, said: "We are excited about the idea of putting on a free, fun event to help locals experience God’s grace and generosity and we hope people will love the sense of fun and belonging. As a local Mum, I see time and time again how local families appreciate activities that give them a sense of belonging to a community. We are also keen to have lead on events to invite people to. Currently, we are thinking of joint-church Alpha course, a messy church event and an Olympic opening night party with the event shown on a big screen in a local church. "We recognise that lots of people are on a journey with their view of Jesus and of the church. Lots of local people would not normally set foot in a church. We hope that the fun day will give them a new experience of Christians working together to put on something free and fun and full of joy. Hopefully people will like what they experience and take a step closer, perhaps attending a lead on event or softening in their approach to faith."